Bangkok has emerged as the world’s top tourist destination, with 15.98 million visitors projected to descend in Thailand’s capital city this year, according to the third annual Global Destination Cities Index released by MasterCard MA +0.30% on Monday. Francoise (right) and Caroline Lledo, a mother and a daughter visiting Bangkok from France, said they enjoy the city’s shopping. Based on data MasterCard collected from governments, central banks, related public agencies and airlines so far this year, the projection for the entire year says Bangkok is surpassing London, the previous holder of the top place, by a very narrow margin. Monday’s report marked the first time any Asian city has been projected to be the top-ranked tourist destination. London came in second, with 15.96 million visitors expected in 2013, and Paris, third, with 13.92 million visitors. MasterCard looked at 132 cities. 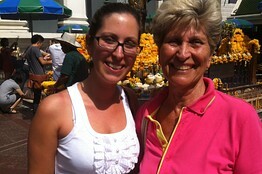 Caroline Lledo, who was visiting with her mother from France, said Thailand has many offerings. “We like culture and the people are so nice. We also love shopping here,” Ms. Lledo said. MasterCard Worldwide’s global economic adviser Yuwa Hedrick-Wong cited overall value for money spent for why Bangkok is attractive. That is true for Thailand overall as well. However, in terms of visitor spending, Bangkok is projected to bring in a total of US$14.3 billion dollars and is ranked at fourth this year, while New York continues to be the top city, where visitors will spend around $18.6 billion dollars in 2013. Tourism Authority of Thailand (TAT) adviser Suwanchai Ritthirak cited official data in saying that each foreign visitor spends an average of 9.6 days and 4,100 baht (about US$141.50) in the country. Therefore, to boost Bangkok’s ranking, more needs to be done to increase either or both factor. Asia-Pacific destinations have outperformed cities in the other parts of the globe, said Mr. Hedrick-Wong. Looking at the past five years, he predicted that Asia will likely continue to see a boost in the number of tourists. Not only will more international visitors visit the region, but more Asians will be traveling to cities beyond their own countries.